Nest-like in shape (hence its name), 2 Nest Village is a cluster of container-shaped, modern homes for El Paso, TX. 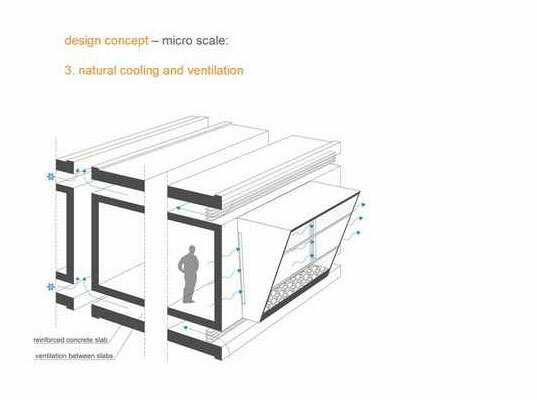 Designed by OFIS Architects, the units are prefabricated and stacked in a way that optimizes light, ventilation and protection from the desert wind and sun. Each home has its own solar shade that not only keeps interior temperatures down, but also adds a cool design element which is amplified due to the repetitive look of the complex. The positioning of the units also creates an oasis-like internal park which is complemented by private terraces and roof gardens. To make construction faster, more sustainable and more affordable, all of the rectangular units will be prefabricated and have common dimensions. Going along the same thought process, the other construction systems and installation details will all be kept uncomplicated. Room sizes, window and door dimensions, closets, and ceiling and floor materials will all be standardized. While the homes appear to be stuck closely together at first glance, there is actually space between each one to facilitate ventilation and a cooling effect. Each container also has its own shading system made of precast wooden panels covered with fabric that sticks out stylishly sort of like an awning. And while the units are shaped like shipping containers, they have thick plaster and stucco walls that maintain inside temperatures. Another noteworthy element is the design of the parking lot. Located underneath the communal garden, the lot maximizes minimizes the heat island effect and storm water runoff since it’s underground. Having an underground lot also maintains the beauty of the landscape (who wants to have a view of an ugly parking lot from their apartment?) and also contributes to LEED credits for protecting and restoring habitat, maximizing open space and others. Lastly, the garage space is used to draw air in from outside and channel it upwards fr ventilation and create a passive heating/cooling effect. This is so awesome! Being an Green Interior Design student born and raised in El Paso, I am very proud and honored. Pretty neat since my capstone senior project is based on container architecture. Bravo OFIS! To make construction faster, more sustainable and more affordable, all of the rectangular units will be prefabricated and have common dimensions. Going along the same thought process, the other construction systems and installation details will all be kept uncomplicated. Room sizes, window and door dimensions, closets, and ceiling and floor materials will all be standardized. While the homes appear to be stuck closely together at first glance, there is actually space between each one to facilitate ventilation and a cooling effect. Each container also has its own shading system made of precast wooden panels covered with fabric that sticks out stylishly sort of like an awning. And while the units are shaped like shipping containers, they have thick plaster and stucco walls that maintain inside temperatures. Another noteworthy element is the design of the parking lot. Located underneath the communal garden, the lot maximizes minimizes the heat island effect and storm water runoff since it's underground. Having an underground lot also maintains the beauty of the landscape (who wants to have a view of an ugly parking lot from their apartment?) and also contributes to LEED credits for protecting and restoring habitat, maximizing open space and others. Lastly, the garage space is used to draw air in from outside and channel it upwards for ventilation and create a passive heating/cooling effect.